To keep your skin and hair from bumming you out all season, try these natural skin care treatments from Ilona Pecnikov, director of esthetics at the New York City spa Just Calm Down, and Julie Gabriel, owner of skin care line Petite Marie Organics and author of The Green Beauty Guide: Your Essential Resource to Organic and Natural Skin Care, Hair Care, Makeup, and Fragrances. You’ll be soft and silky in no time. #1: Dab on olive oil. When it comes to strategies for natural dry skin care, Gabriel swears by olive oil, an amazing multi-tasker. It instantly grooms dry cuticles, works wonders on hands and elbows, removes makeup, and soothes and conditions itchy, dry skin all over the body. 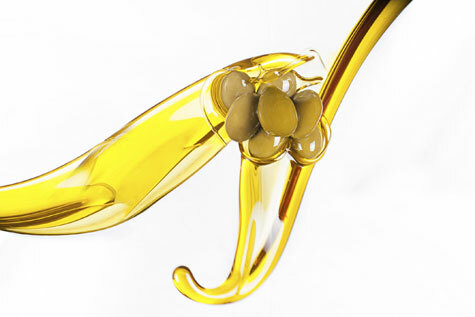 ”When your skin feels extra parched, you can dab a thin layer of organic extra-virgin olive oil under your moisturizer for an extra dose of antioxidants and good fatty acids,” adds Gabriel. #2: Try natural exfoliants like yogurt, papaya, and pumpkin. You can find plenty of options for natural dry skin care in your kitchen, or in the produce and diary aisles of your supermarket. Yogurt, especially the plain Greek variety, makes an excellent cleanser with a mild exfoliating action that will remove dry skin and leave you feeling refreshed and comfortable. Gabriel says it’s a particularly safe exfoliant for very dry skin because it exfoliates using lactic acid, not scrubbing granules. To add some oomph, try making Pecnikov’s Greek Yogurt and Papaya Enzyme Conditioning Mask for Face & Décolleté: Mix ½ cup of Greek yogurt with 3 tablespoons of mashed-up papaya, and apply to skin. Pumpkin enzymes are at play in her Pumpkin & Cinnamon Mask for Face and Body: mix one can of pure pumpkin and a ½ teaspoon of powdered cinnamon. Leave either mask on face or body for 5 to 15 minutes. Or treat your extremities to her Three Berry Antioxidant Hand and Foot Mask: Mix 3/4 cup each of strawberries, raspberries, and blueberries with ½ cup kefir in blender. Drink any leftovers! #3: Make a homemade skin scrub. Economical and effective, a combo of sugar and any oil you may have around the kitchen makes a rich, nourishing body scrub for dry skin, according to Gabriel. Simply mix equal amounts of fine brown sugar and oil, and rub on using light circular motions. For an extra dose of vitamins and minerals, add a tablespoon of honey. Pecnikov adds lemon juice to her recipe. Make sure to shower thoroughly afterwards! #4: Harvest the healing power of honey. Honey is a time-tested cure for chapped, cracked lips, according to Gabriel. Apply a little organic honey in the evening and wake up to smooth, yummy lips. This trick also works to soothe cracked heels and rough elbows. #5: Try natural remedies for dry hair. For dry hair, mix one egg yolk and a tablespoon of liquid castile soap to shampoo your hair and condition your itchy scalp. Egg yolks, when massaged into the hair and left to work for 5 to 6 minutes, may strengthen the scalp, and some believe it prevents hair loss, says Gabriel. Or try Pecnikov's Hydrating Mask for Dry Overworked Hair: Mix 1 avocado with 2 tablespoons each of lightly heated organic grape seed and olive oil. Massage into hair, and put plastic shower cap on head to retain heat and moisture. Leave on hair for 15 minutes. Double the ingredients for longer hair. #6: And don't forget to treat your skin from the inside out. "A diet rich in magnesium, essential fatty acids, vitamin C, and beta-carotene naturally feeds your skin from inside and makes it less prone to dryness," says Gabriel. She recommends feeding your skin with a meal plan that includes organic dark chocolate, salmon and other fatty fish, oranges, mango, and carrots.